BarkTHINS® Snacking Chocolate Dark Chocolate Almond With Sea Salt. Fair Trade Certified™ ingredients. Non-GMO project verified. Break Up With Boring™. *Fair Trade Certified™ by Fair Trade USA. Over 65% Fair Trade ingredients. 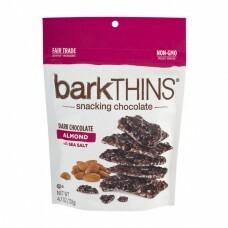 barkTHINS® are thin slivers of snackable dark chocolate packed with amazingly simple and real ingredients. They're craveable, shareable, and breakable, so you can enjoy whenever (or whyever) you want. It's what chocolate should be... fun, irresistibly delicious and anything but boring! Check out all our delicious flavors at barkthins.com. Almond. Pretzel. Pumpkin seed. Mint. Coconut almond. Blueberry crunch. Fair Trade Certified™. Ingredients. Non GMO project. Verified. nongmoproject.org. Hey barkFans! Let's talk between bites. barkthins.com. For the best tasting barkTHINS® keep them cool!